Can you imagine?... It's exists! 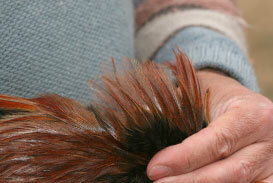 The magic of the feather "Gallo de Leon" is at your fingertips. This is possibly the best material in the world for fly tying. 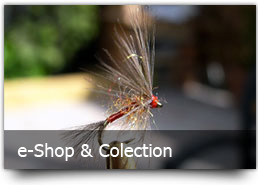 Can you imagine a fly-tying material being used for more than 600 years and limited to a bunch of fishermen worldwide? Can you imagine a fly-tying material so simple to work with, and get a brand new set of incredible "effective" flies? "There are no finer imitations, natural or synthetic, for tails, legs, and wings than the feathers of the Spanish Coq de León"
During more than five hundred years, there is only one small Spanish region where these feathers can be found, probably be the best material in the world to assemble artificial flies, the Feather of Gallo de León (GDL). 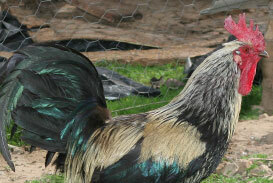 Nowadays, the feather of Gallo de León is known and in demand all over the World. The Pardos and Indios give off a kind of perfume, a fragrance that captivates any fishermen who looks at them. 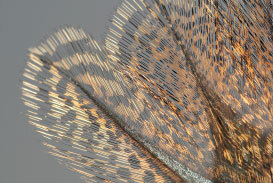 But we must remember that the quality of these unique feathers depends on the selective breeding, and not just anywhere, but rather only in its original habitat. For this reason, the production is very limited and their value is very high. GDL feathers are also produced outside the region of the Curueño River, even as far afield as Colorado (USA). Here the Whiting Company produces and distributes them with rooster's descendants of the Coq de León, but the quality of product isn't comparable to best original feathers from the La Vecilla. Gallos de León have a curious peculiarity that make them unique in the World. When they are moved from their usual region, the Curueño Valley, their feathers begin to lose their quality. The Feather of Gallo de León is divided into two types: Pardo and Indio. Their differences are obvious especially from the pencas of the Pardo feathers. In any case, only a physical observation of the "mazo" allows us to define the variety because a photograph could never show the delicate shades of color and brilliance that sparkle in a good feather. Nowadays breeders aren't totally in agreement about the classification of the existing varieties of feathers. For this reason we can find that the individual classifications of the breeders do not always add up to generally agreed criteria. Feathers without curling at the feather tips. Feathers without damage: Due to fights, etc. Feathers without contrast: With brilliance in the back. Perceptible pencas in both sides. Fibbers must dry up quickly after they get wet. 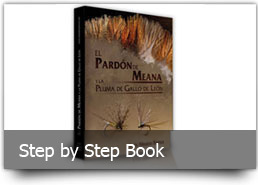 In the book "The Pardón de Meana and the feather of Gallo de León" we have the privilege to see, for the first time, a definitive criterion model, pre-agreed with the breeders. It is a document for the commercial classification of feathers with reference to their features, and generated with a view to the possible production of a Guarantee of Origin. This classification was born from the aim of the Asociación de Criadores de Gallo de León. "The Pardón de Meana and the feather of Gallo de León"
Currently, the production of "just top quality feathers", the most brilliant and effective, so called "the magic feather", does not exceed 35% of total production. Requires only extra quality! Send us a message by e-mail. We will make a personalized selection for you.